This week: This time, I take a closer look at the scientific simulation game Take on Mars. Players can discover the red planet almost the same way as NASA does and thus develop a deeper understanding of space science. I’ve already presented Take on Mars several weeks ago. Now, I gathered some first hand experience by playing it. In contrast to NASA’s Mars program, the player fortunately hasn’t to deal with financial problems and a shutdown. 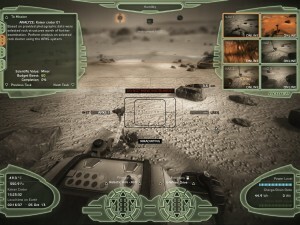 Additionally, the player hasn’t to deal with short launch windows to be able to reach the red planet in an efficient way. The role of the player begins with the landing on Mars and the exploration of it using landers and rovers. The rovers are landed on Mars as in the real world: small rovers survive the landing with huge airbags and bigger rovers even need the help of a sky crane. Finally, the player is in control of the rover’s function on the surface of the planet. The player can conduct scientific experience by solving different research mssions. A rover similiar to Curiosity. 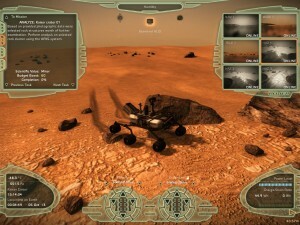 In the current version of the game (it’s still in the early access phase), most of the experiments are taking photographs of the martian landscape or analyzing rocks, sand or the atmosphere. For this purpose, the user can take advantage of scientific tools also used in the real Mars program like the Alpha particle X-ray spectrometer (APXS). The small rovers at the beginning of the game do have only a few tools that don’t need any manipulation. The APXS device only needs to be placed close to the desired target to allow the player to conduct an analysis of it. More complex rovers are equiped with a robotic arm and a robotic „hand“. The user now has also controls for each component of the rover. The player needs to drive close to the desired target and switch to the robotic arm controls. After some precise manipulation of the arm and the hand, the scientific tool is placed at the target and the player can start the analytic process. After a certain amount of time, the player gets the results of the analysis. I don’t have any experience in controlling a real Mars rover, but playing the game feels quite real. It’s a complicated process of using a robotic arm and hand to finally analyse a small rock. Playing the game brings the science of Mars exploration closer to the players. The difficulty of the game ramps up very slowly and introduces new players in a fun way to the complex work of exploring a distant world. Additionally, the tools and rovers look and work quite similiar as the real world ones and are thus creating a realistic envirionment. However, the player has the luxury of playing a game: there’s no communication delay and the experiments are taking less time than in real world. Players who get hooked up by the game develop a deeper understanding of the difficult work of NASA’s scientists and might also start looking up additional information about the Mars program. Maybe some of them will start a career in the field of space exploration. The game helps to bring science closer to the public and helps to explain how complex the work is.